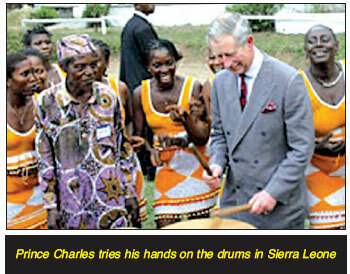 Britain’s Prince Charles expressed his solidarity with Sierra Leoneans’ efforts to rebuild their war-shattered country during his first visit to the former British colony. The heir to Britain’s throne received an enthusiastic welcome, although some people in the poor West African state said foreign powers should do more to help rebuild their country, devastated by 11 years of civil war. Sierra Leone receives 40 million pounds ($114 million) a year from Britain, but still ranks as the second-leastdeveloped country in the world, according to the United Nation. Its 1991-2002 civil war, fuelled by the trade in “blood diamonds” in return for arms, was notorious for the RUF rebels’ mutilation of women and children. The prince visited a jungle warfare school where the British army was helping to train Sierra Leonean soldiers, many of them former child combatants. Charles made the trip to recognise progress made ahead of elections slated for July next year. But he acknowledged the “immense and overwhelming challenges to rebuild this country”.